It’s a love that was born in a cinema in 1950s Cold War Berlin and that has been nourished for over six decades by taking in at least a movie a day together. 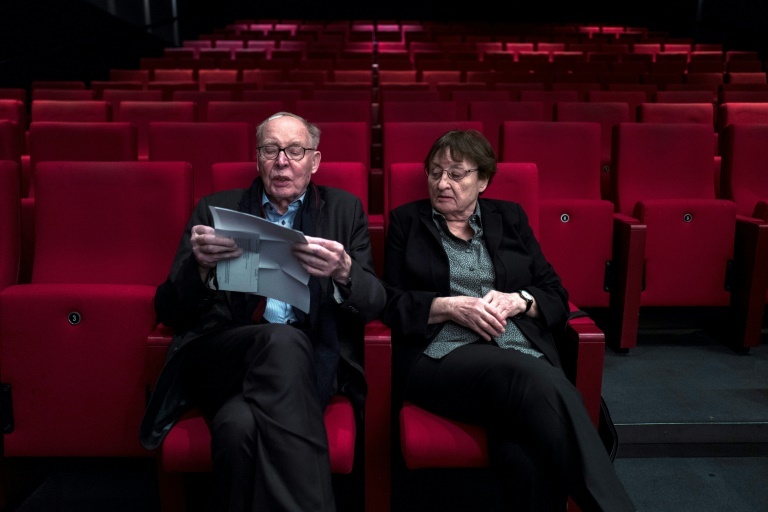 At this week’s Berlin film festival, Erika and Ulrich Gregor, now in their 80s, are absolute fixtures. Year after year, they can be spotted gingerly making their way, arm in arm, from theatre to theatre to catch as many screenings each day as they can. “We’ve watched thousands and thousands of films together,” Ulrich, 85, told AFP in an interview at the Arsenal cinema they helped found. It’s that kind of shared passion that the Gregors say has kept their relationship thriving after nearly 60 years of marriage. The pair met as students at West Berlin’s Free University in 1957, when Ulrich was hosting a film evening. “It was ‘People on Sunday’,” a 1930 German silent film, “and there was one woman who had very strong views,” he said. “Everybody loved the movie but I thought it was sexist and said so,” recalled Erika, 83. She was immediately taken with Ulrich, who stands two heads taller than his petite wife. She ended up joining the film club’s board. Ulrich returned from the Cannes festival one year raving about Polish directors such as Andrzej Wajda and Andrzej Munk. Erika suggested they start showcasing cinema from behind the Iron Curtain — a controversial move with capitalist West Berlin on the front lines of geopolitical tensions. “We hopped on a Vespa and rode to the Polish military mission in East Berlin and rang the bell,” she said. Ulrich said that because of “strong anti-communist prejudices” they had to fight hostile administrators to show Eastern European films, but Erika’s more impulsive style and his diplomatic skills “complement each other in a really special way”. The Gregors married in 1960 — a year before the Berlin Wall went up — and soon started a family. But it didn’t stop their nearly obsessive moviegoing. “It wasn’t easy because we had two children. We were lucky because they could have hated the cinema — it took their parents away from them. But the kids got used to it and we raised them that way,” he said. “It was a different time, when I see how mothers parent today,” Erika said. That meant bringing the children to film festivals as well: Venice, Locarno, Moscow and the biggest of all, Cannes, which they still attend every year. The Gregors collaborated on writing about film history in books and articles, founded an arthouse cinema and ran a section of the Berlin film festival showcasing avant-garde movies that is still going strong. They were early champions of filmmakers such as Wong Kar-wai, Theo Angelopoulos, Aki Kaurismaki and Belgium’s two-time Cannes winners Jean-Pierre and Luc Dardenne. “Everything we did ended up being a shared project — you couldn’t draw a dividing line between my work and hers,” Ulrich said. For all their love of cinema — and each other — both say that it’s a difficult emotion to capture on film. “What’s love? It’s respect, it’s affection, it’s trust. But the love stories we love on screen are all tragic,” Erika said, citing Michael Haneke’s “Amour”, “The Cry” by Michelangelo Antonioni and Yasujiro Ozu’s “Tokyo Story” among their favourites. Ulrich said as much as they both enjoy a satisfying ending, there’s still nothing quite like the promise held in the start of a film.